Thanks Gambass. Just no written rules at all, for no one of the various versions of the game? I fancied to replay with friends a game according to the then-a-days rules, with heavy ball, without the permission of running with it and without tries. Jumping one century forward... I've seen casually on the net this 1934 poster of the Catalunya v Italy match, ended 5-5. 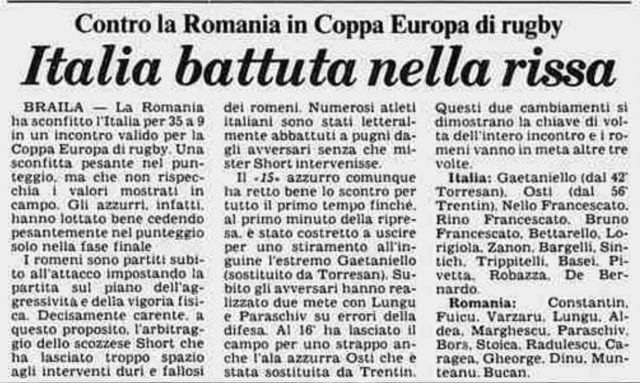 On the side the report of the game, from the historical on line archive of newspaper "La Stampa" from Turin. "Twenty thousands spectators"! Canalina wrote: Thanks Gambass. Just no written rules at all, for no one of the various versions of the game? You can find some written rules here and there (like the interdiction of ball handling per exemple), but I d'ont think, you could find a full comprehensive set of rules. And in any case, it will be only valid for one school. - After 1969, the opponents of the DRSV selection were often not the national teams of each country, so these games do not count as an international match. This list is aligned with the following rugby associations: DEN, NED, ROU, SRB (for YUG) and SWE. The matches against POL were compared with the book "Encyclopedia polskiego rugby" by Maciej Powała-Niedźwiecki and Jacek Wierzbicki, the matches against TCH with the books "60 Let Československého Ragby" and "75 Let Českého Ragby" by Petr Skála. Special thanks go to Vesso Stoyanov from the Bulgarian rugby association, who provided data on the tournaments and games in Bulgaria. In some XIX century rugby photos, like the one below from 1893, you may see a player collocated a bit far from the other, under his posts, acting like a goalkeeper. It seems a collocation a bit pointless if the opponents can score also kicking above the bar or running into the try-area on the side of the posts, but that position would have a sense if the opponents may run into a try only between the posts, like in soccer. Do you know if during a period of the rugby history there was the obligation to score a try just through the posts? I bought in New Zealand! The Serbian "National" rugby team, April 1918 when they played in Edinburgh. The team was formed of youngsters from Serbia, then a Kingdom under foreign occupation, who were secretly sent to George Heriots School in Edinburgh via Albania and Greece in 1916 for recuperation (many youngsters fought in the liberation army ) and education. It seems they took to rugby quite well and quickly. Apparently 10 000 people watched them in what appears to have been a 7s tournament beat a multinational schools selection 8 - 3. Fantastic stuff. Rugby de muerte (no translation needed I guess) as it was called back then. My first guess was that the team in darker shirts should be RG Heidelberg, as they don't use any stripes in opposite to SC Neuenheim and Heidelberger RK. But I could be wrong. They did try to inforce them (well some of them did try), but it failed miserabily which led to the British leaving (1931), the birth of RL (1934), and ultimately to the end of the club championship (1939, as to reunite with the British). gambass wrote: Fantastic stuff. Rugby de muerte (no translation needed I guess) as it was called back then. Retro Rugby Romania is a new youtube channel which aim to put online videos of the matches played by Oaks or other Romanian rugby teams. This is played in Braila where it was not any rugby team back than in first division if I remember well (at least I couldn't find any). @iul, could you please fix whatever isn't working when posting videos from youtube? Sometimes works, sometimes don't , I am trying to guess each time what's the link to post it. Thanks. Last edited by amz on Fri, 04 May 2018, 07:00, edited 2 times in total. This is the article of "La Stampa", a newspaper based in Turin, about that match. An article quite justificatory: "the causes of the loss are the referee Short, which permitted the romanian fists that knocked down our players, and two forced substitutions due to injuries". Italian points were all scored by flyhalf Stefano Bettarello: one try, one penalty, one conversion. Was that Stoica related to Christian Stoica, which played for Italy twenty years later? Thanks for the channel, well done! Thank you Canalina! On my forum I have a small option that takes all media automatically (twitter, Facebook, youtube) and it's the same software, maybe we can have the same here. I guess is one mistake in the line up in the second row, is Dumitru not Gheorghe (this is his first name). Enciu Stoica died because of a gastric cancer. @FR Maybe you confuse him with one of the Marian Aldea or Gheorghe Hustiu who both died in car accidents.